Cracked tooth syndrome - What is Cracked tooth syndrome? Cracked tooth syndrome – What is it? This is the first in a series of 7 posts about orofacial pain with difficult to diagnosis or unusual origin. patient and doctor to locate where the pain is coming from. It becomes exponentially more difficult if the tooth already has a crown on it. While some of these teeth can be saved with a root canal and crown others may have the crack extend into areas that there exists no successful treatment for other than to remove the tooth. We use a special dye (this particular tooth was split in half) to help view the extent of the crack. Typically if the crack extends to the bone level or across the tooth there is little chance of saving the tooth. 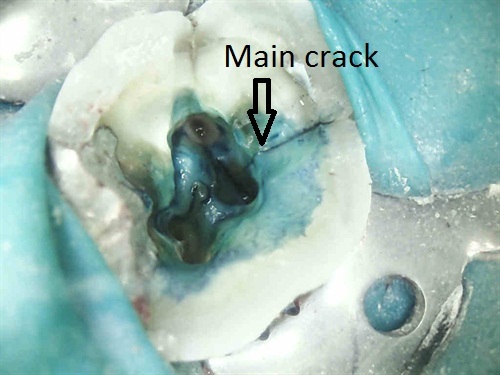 Unfortunately the bone level is an area hidden under the gum tissue, so there is no way of knowing for sure if the crack goes to that level or not without removing the tooth. Exactly when to try save a tooth and when to throw in the towel is controversial. I recently posted the picture below, along with the symptoms, on a dental blog called dentaltown under thread “Is this crack too much?” 11/01/2012. The way in which different doctors wished to treat it varied greatly amongst the 40 or so that replied. Many were very confident that “their way” was the only way to treat this tooth. The facebook page of dentaltown also picked up the issue and gathered a good response.